Paper is dead and everything is digital these days. Not quite, it was the big promise twenty years ago, but we are still nostalgic about the use of paper. Having something physical in the context of all this fast changing content and information battle. Into the mists of the storm comes a promis of a little gadget that potentially bridges the gap and links the digital online world with the physicality of your paper. Its tiny and could soon be your best friend. Berg presents the Little Printer. Image taken from Engadget / This little box is your new best friend and keeps you uptodate with the lastest buzz. 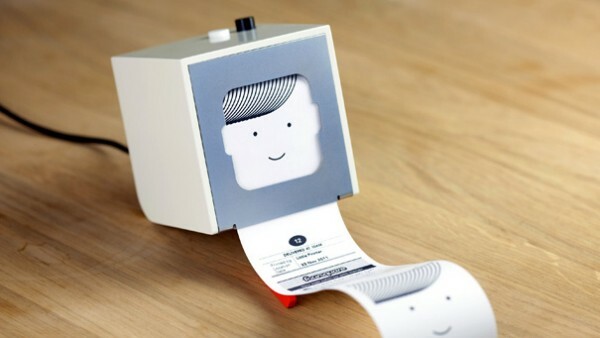 Little Printer by Berg. Its a small printer, printing receipt size role paper with anything you feed it via a mobile phone or a Wi-Fi connection, via Wired. Berg has started to implement some news sources as well as enabled RSS feeds. It is even possible to send messages to other printers directly. Image taken from Berg / You can print a summary of the latest news are for example from Foursquare. Berg have earlier started to look into the topic of information feeds and ways to integrate the feeds poeple consume on their small mobile phone screens with oder media. There were ideas integrating billboards, train table messaging boards, train tickets and so on. See a summary HERE. With this new gadget that is announced to be available in 2012 Berg introduce a whole family of possible gadgets summarised as the Berg-Cloud. This is good marketing!